There is nothing like a weekend spending in barbecuing your favourite meal and enjoying it with your friends and family, Isn’t it? But the outdoor cooking and barbecuing lovers also faced a normal problem very often that is burned strip steak due to insufficient illumination. So they love to use Grill Light to overcome this situation. However initially people used to prefer normal electricity powered normal lights to glow up their barbecue but those lights used to consume so much electricity and because of wire your barbecue did not able for movement. LEDs are a revolutionary technology and replacing almost all types of lighting needs these day, barbecue lighting as well. Our today’s pick is Kuisiware Barbecue Grill Light, it is bright, has energy efficient battery powered LEDs, value for money and also made with heavy duty plastic to stay steady with your barbecue. 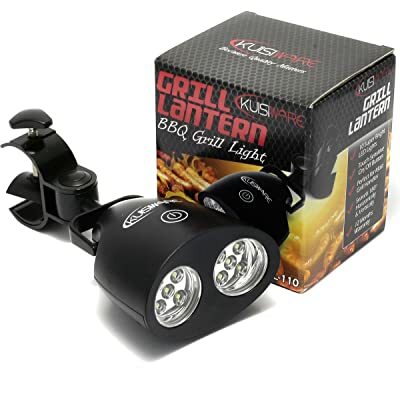 Kuisiware grill lights is a well manufactured accessory for outdoor cooking and barbecuing it easily mounts on handles of many types of grills and barbecues. Operated by battery it delivers quite a long service time, has a power button which is touch sensitive, And a unique handle design which is adjustable and makes is most versatile product among its competitors. It can illuminate your grill in any kind of light either in day light or in dark night. 10 LED bulbs are fitted in it and makes ultra bright. It comes with a ABS plastic case which is water and heat resistive which makes it heavy duty and assures long durability. Best point with this product is its manufacturer offers 60 days money back guarantee and also life time warranty so do not need to be worried about upcoming so many years. Easy to install and un install. Batteries last so long, up to 18 hours. Adjustable handle screw clamp it is easy to match with any type of grill machine. Made with nylon fibre which is water and heat resistive. Touch sensitive buttons are easy to operate. 10 super bright LED bulbs for better lighting need. Screw clamp can be fitted with any handle within 3.7cm diameter. Operated with 3 AA size batteries. Energy efficiency can illuminate the light up to 50 hours with new batteries. Can swivels up to 180 degree vertically and horizontally. 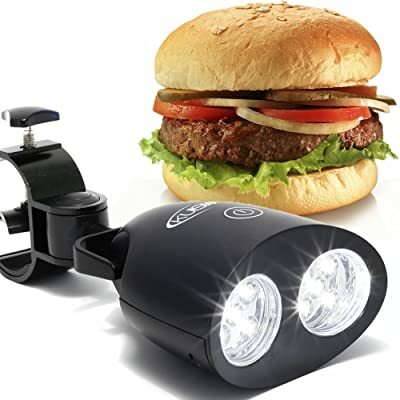 It LED light has an adjustable screw clamp, by which it can be easily mount with most the grill machines model. It also supports circular, oval and rectangular all kind of handles. Laded with a unique touch sensitive on off switch this barbecue light is very easy to operate. Simply touch it with anything and make it on or off. It includes 3 AA size battery, so you can start using this product right after getting it. LED bulbs are so energy efficient and batteries last really long. Quality of all 10 LEDs are quite impressive, with luminous flux of 105 it can bright up all the barbicue surface. Only comes in black color, no other color variant are there. Even though it is good for black or stainless steel finished grills but looks odd in case of fancy colored grills. Battery compartment is unnecessarily tight with very small screw and need very tiny screw driver to open it. It is a little bit ugly as compare to other fancy grills light but delivers better than most of those. Kuisiware LED grill light has been received more than 81 percent 5 star ratings from the users, and it deserves it, color variant and ugly look surly cannot hide the so many other qualities of this products. It serves well, suits all kind of needs and makes your barbecuing experience better. It is light weighted, easy to operate, easy to fix and there are so many good things which already described in this review. On a final note Kuisiware LED grill light would not disappoint you with its service and worth every penny you have spent to buy it.